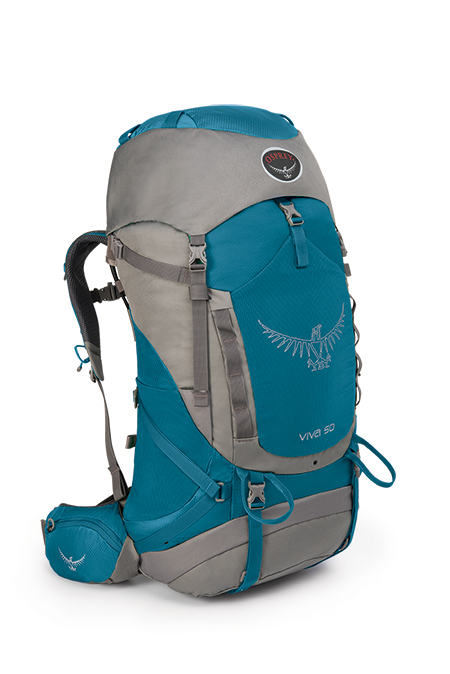 The women�s-specific Osprey Viva 50 boasts a simple, clean design. Along with a pared-down shape, this durable pack is easily adjusted to accommodate various torso shapes without sacrificing comfort. Dual side compression straps provide load stability and the LightWire� peripheral frame transfers the weight to your hips where a Fit-On-the Fly� waist-belt easily adjusts up to three inches for a custom fit. In addition, the torso length has five inches of travel making this pack a shape-shifter capable of quickly adapting to many torso sizes. The back panel is made of mesh for ventilation and comfort during periods of high exertion�i.e. when you�re trudging up a south-facing slope carrying an overnight pack in the hot sun. Fortunately, the external hydration sleeve gives you a clear shot at drinking water and also ensures that refills don�t create soggy gear if there�s a slip when refilling the reservoir (sold separately.) Two mesh side pockets and a front mesh stash pocket combine with dual zippered waist belt pockets provide a plethora of on-the-go storage options. To expedite packing, the sleeping bag compartment is separate from the main compartment and the external sleeping pad straps are removable when you�re going ultra-light. Stow-on-the-Go� Trekking Pole attachments allow you to quickly secure poles when not in use.